One of my collectors loaned me a flute. 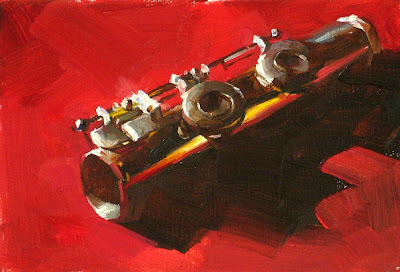 She hopes I can do painting of flute someday. I thought about this project for a long time. I found my usual approach didn't work well with this elegant and intricate instrument. It is very different from painting flowers. I have to follow many of my engineering discipline for this painting. Now I am out of my comfort zone now and explore new territories. I am glad I did it. There is a lot of fun to give precisely designed mechanical parts a painterly look. I think I will involve high-tech stuff into my still-lifes soon. By the way, the magazine that has the article about me is on the shelf of major bookstore now. I hope you enjoy reading it. I did this painting on Tuesday night. It felt like doing en plein air. At that evening, my son had a concert. He plays trumpet. So we went to see and cheer for his show. Due to the time constrain, I knew I didn't have enough time to paint. So I asked my wife in advance to set up something she likes. Well, She did a very complicated one for me. I didn't change anything in the setup, but painted only a small portion of it. 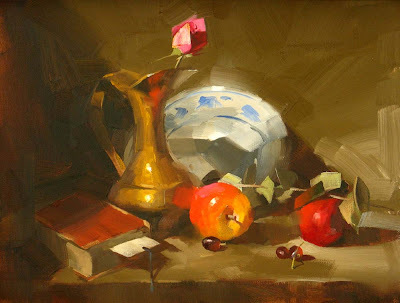 Can I call it plein air still life even it was done indoors? Maybe not, but who cares. After I posted my "color of white" question, I got many many "two cents". My piggy bank has exploded. Thank you so much for sharing your experiences and knowledge with me. Today I want share one of my gallery paintings with you. I did this one about a week ago. That was the time I was pondering about the color of white. I am going to practice the tips I learned. After I become good at it, I will feed back to you. 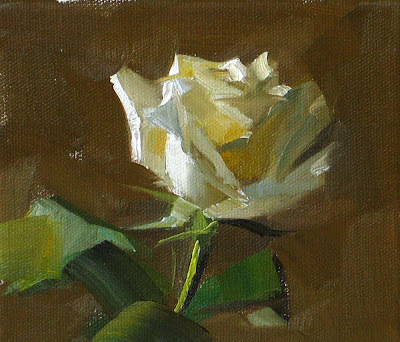 I don't remember I painted white roses before, but with this one, I was working on painting the colors of "white", I did similar study on white cups and drapery before, but I feel I am still not there yet. 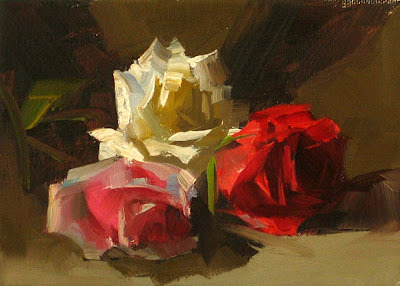 I really admire those master painters who can put many colors on a white object, but still be remarkably convincing the object is white. If you have experiences of doing that, would you mind share your two cents? 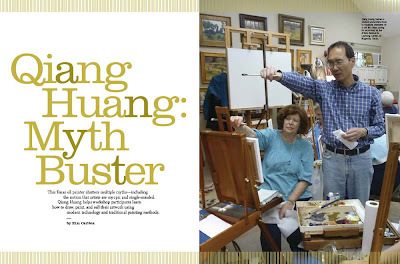 The article featuring my painting and workshop teaching has come out. It shows on the summer issue of the "Workshop" magazine, which is the special edition of the American Artist Magazine. If you are a subscriber of the magazine, you should have received it now. I have not seen this issue at the bookstores yet, but it should be available soon. You may read the on-line version of this article by click here. This article marks a major milestone in my art career. When I started daily painting 2.5 years ago, I never thought I could go this far. 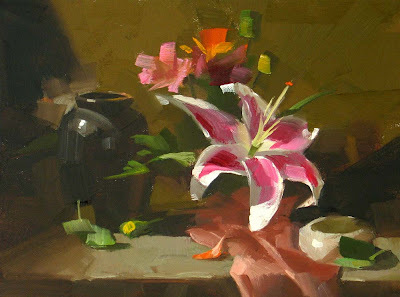 Currently, I am scheduling new painting workshops for 2010. 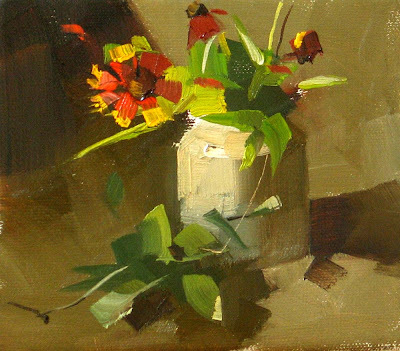 If you are interested in having me teach a class at your location, please send me an email. I will be more than happy to share my experiences with you. 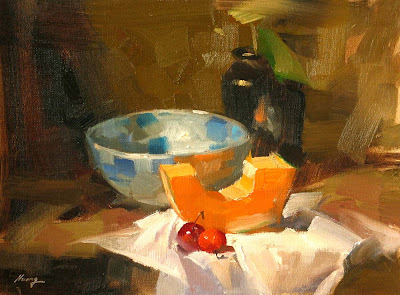 This is the second demo painting at my Austin workshop. I did a similar painting not long ago, and I like the composition a lot. So I did it again. I just had another great workshop last weekend. This one was local, in Austin, TX. I want to express my sincere appreciation to Mrs. Karen Wilkerson for organizing this workshop. I want to thank all the new and old artist friends for attending. We surely have had a lot of fun, haven't we? I felt very grateful for my wife Song and my son Jonathan for assisting me. This is my demo painting at the first day. Please enjoy. This painting has a similar composition of the previous one. I really like the strong light effect behind the dark object. Starting from tomorrow, I will teach a 3-day workshop in Austin. I will share with you my demo paintings soon. I did this painting as a demo at the Wimberley Valley Art League, TX on Monday night. I was so excited seeing quite a few my old artist friends, and met many new friends as well. The composition of this one I used before, but not very often. 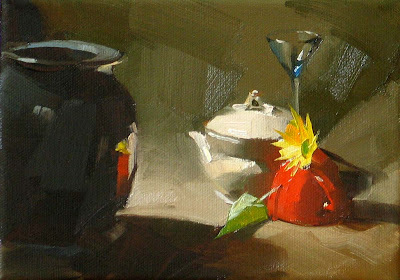 The foreground darks enhance the light area behind it giving a sharp contrast. This helps the center of focus coming out more. It surely was a fun evening I had. Today is the Mother's day. 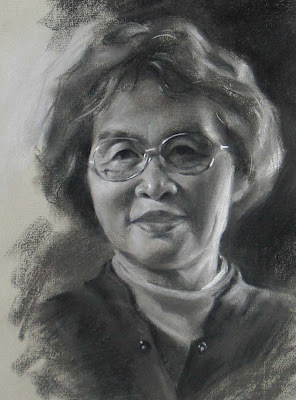 I want share with you a pastel portrait I did of my Mom. She lives in Beijing, China. I am going to visit her in July. Mother's love is the greatest love. I cannot put into words to express it. At this moment, I want to declare to the world: "Mom, I love you!!!" I did this portrait about nine years ago. It is on the wall of my studio. She watches me and gives me confident to paint all the paintings. In front of my house, we have many kinds of bushes I don't know their names. At this moment, very colorful flowers are blooming. My wife got a bunch and I put it on my still life stand. I didn't do any adjustment (it was rare), and painted it as the way it was. Everything went smoothly. I started the painting around 6:30 PM. When I finish, it still had daylight. I had been a good day. 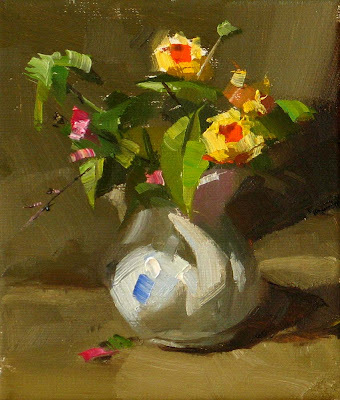 Having not paint small for a while, when I faced this 5"x6" canvas, It seemed so tiny. It took me quite a moment to reset my memory. I had a pretty busy setup as well, so I had to make a few decisions on what and how I should paint. Now in Texas, the bluebonnet season is over, replacing it, we see vibrant red, yellow, and purple out of many kinds of wild flowers. Indian blanket is one of them. I really like its down-to-earth property. It is humble and strong. I have something different for you today. I spent two days about 8 hours doing this pencil drawing. 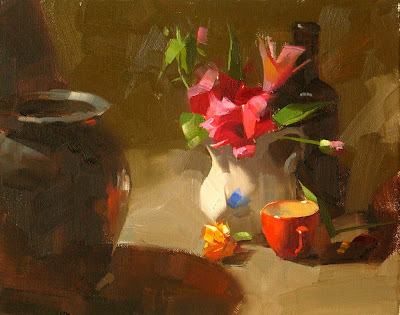 This kind of exercise is the most fundamental study for any type of representational art. 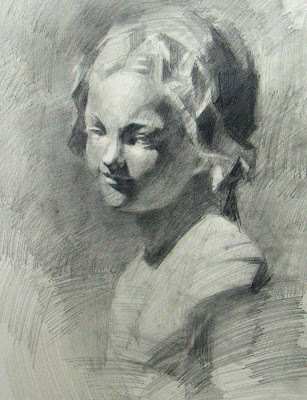 In serious academic art schools, students do drawing for two years before they start painting. I wish I had been trained that way. Now and then, I often feel that the foundation of my art is not solid enough. I dream some day, I can devote 40 hours or more to do one drawing under the guidance of art master. This drawing is a long way from the quality I want, but I want share it with you and document what I am doing at this time. 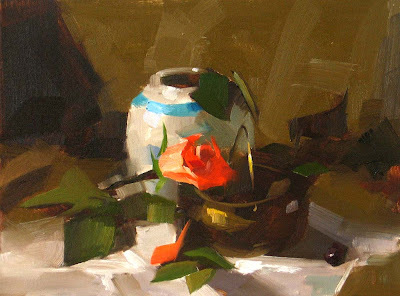 If you are new in painting, I highly recommend you doing many of this kind of drawings. It will help you big time. This 12" x 16" Gallery painting took me three days to finish. I usually use value as my design tool to compose, but in this one I was testing decreasing my value contrast. The brass and the background value are rather similar. I use edge treatment and local value contrast to define the shape of the brass. I also did not use white drapery for my foreground as I use to. I have not done small paintings for a while, but I will come back to it.